Royal Caribbean is offering up to 40% off pre-cruise purchases made this weekend during its Cyber Monday offer. Deluxe Beverage Package. Discount Varies by Ship. Refreshment Package: 40% off onboard prices. Chops Grille Dinner: Save 20% off. Discount varies by ship. Izumi Dinner: Save 20% off. Discount varies by ship. Ultimate Dining Package: Buy One, Get One 50% off. Discount varies by ship. Royal Caribbean's Black Friday and Cyber Monday deal could save you up to $300 off a cruise vacation. Cruise must be booked between November 22, 2018 – November 27, 2018. Offer applies to sailings departing on or after December 22, 2018. On sailings 5 nights or less, $50 savings for Interior and Ocean View, $75 for Balconies and $125 for Suites. on sailing 6 nights or longer, $75 savings for Interior and Ocean View, $200 for Balconies and $300 for Suites. Kids Sail Free: provides free cruise fare for 3rd guests and higher who are 12 years old or younger on 4-night or longer Alaska, Bahamas, Bermuda, Canada, Caribbean, CaribNE, Coastal, Cuba, Europe and Hawaii sailings departing between December 1, 2018 – December 14, 2019. Offer excludes Holiday sailings (Sailings between December 18, 2018 – January 1, 2019), President’s Day sailings (Sailings between February 15 – 18, 2019), Spring Break sailings (Sailings between March 16 – 30, 2019), Holy Week/Easter sailings (Sailings between April 13 – 22, 2019) Summer sailings (Sailings between May 15 – August 31, 2019) and 2019 Thanksgiving sailings (Sailings between November 23 – 30, 2019). 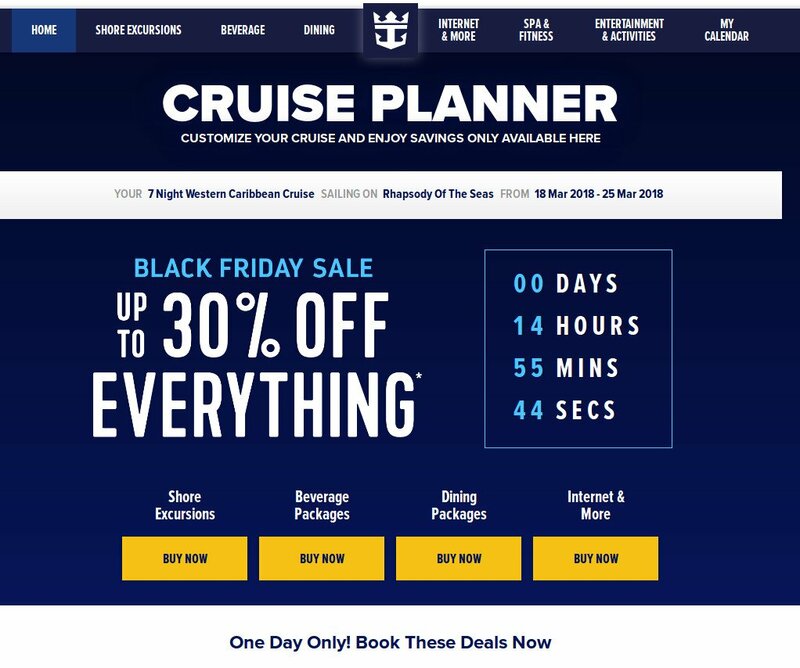 In addition to Royal Caribbean's Black Friday deal on cruises booked, the cruise line is also offering up to 30% off everything on pre-cruise purchases made via the Cruise Planner. The Black Friday Sale runs through the end of Friday, November 24, 2017 and applies to options like beverage packages, shore excursions and more. The exact discounts available will vary from sailing to sailing, but it may be worth checking which discounts are available for your sailing. Royal Caribbean announced its upcoming Black Friday/Cyber Monday deal, which will offer 50% off second guests and up to $400 onboard credit per stateroom. The Three-Day Cyber Monday Sale is valid on cruises booked November 24-27, 2017 11:59 p.m. EST for sailings departing on or after December 24, 2017. Offer excludes China departures. Guests can get an additional $100 onboard credit if they elect to book a sailing more than six months in advance with the Non-Refundable Deposit program. Offer is combinable with select promotions. Offer open to residents of U.S. or Canada. Royal Caribbean is offering discounts on select pre-cruise purchases via its Cruise Planner site that coincides with Black Friday. The Black Friday through Cyber Monday Super Sale runs through the end of Monday, November 28 at midnight and applies to options like beverage packages, shore excursions and more. Royal Caribbean is getting into the holiday buying spirit, with a three day "Cyber Monday Super Sale" that will offer quite a bit of onboard credit on top of the cruise line's current promotion. This great offer can be combined with Royal Caribbean’s November offer featuring BOGO 50% off with 25% savings for 3rd and 4th guests plus up to $100 Onboard Credit per stateroom. Just in time for the biggest shopping weekend of the year, Royal Caribbean is rolling out a Black Friday and Cyber Monday deal. 25% savings for 3rd and 4th passengers booked in the same stateroom for Caribbean sailings departing Jan-May, 2016. One Voom internet package for one device on Anthem, Harmony, Allure, Oasis, Freedom, and Enchantment of the Seas on sailings departing between May 1 - September 30, 2016. Offer applies to all sailings departing on or after Dec 10, 2015, excluding China departures. The Cyber Monday sale is essentially the same as the Black Friday sale, but with a bit more onboard credit. Cruise must be booked Nov. 30, 2015. BOGO is combinable with the adjoining OBC, 3rd and 4th Guest Savings and Voom offers, Crown & Anchor discounts and NextCruise offers; BOGO and 50% 3rd and 4th Guest Savings are not combinable with restricted rates (for example, Seniors, Residents, Military). OBC and Voom offers are combinable with restricted rates (for example, Seniors, Residents, Military, BOGO) and NextCruise offers. OBC and Voom offers are not combinable with Crown & Anchor discounts. Neither offer is combinable with any other offer or promotion, including, but not limited to, Interline, Travel Agent, Travel Agent Friends and Family, weekly Sales Events, Net Rates, Shareholder Benefits.